Please welcome back Desiree Leonard to That Fish Blog. We as biologists at times take our knowledge for granted and forget that not everyone that is involved in the hobby is fully aware of all of the natural processes and progressions which occur in a saltwater aquarium. In all likelihood, these are Amphipods and Copepods; shrimp-like crustaceans that dwell in the substrate and rocks. Because of the thousands of species contained within these groups in Class Crustacea, I am not going into detail about the taxonomy of these organisms, but here are some basic facts about these tiny crustaceans. • There are both pelagic (free swimming), and benthic (bottom dwelling) bugs. • Copepods occur in all types of aquatic ecosystems; freshwater, estuarine (brackish) and marine. • Amphipods are mostly found in marine ecosystems, but there are some freshwater and terrestrial species. • They are just a few of the tiny animal organisms that make up zooplankton, which contributes to the overall make up of plankton. • These creatures eat phytoplankton (tiny plants and algae that also help make up plankton), small microzooplankton (the division of zooplankton that are smaller than 200 microns, or 1/127th of an inch in size), and detritus. • Only a few of the thousands of species of copepods and amphipods known are carnivorous or parasitic, and these are rarely found in a saltwater aquarium system. • For many saltwater fish and other marine species, copepods and amphipods are a primary food source, both in nature and in captivity. • Because these tiny organisms are a natural part of the plankton food chain in the ocean realm, they are naturally going to occur in a saltwater aquarium environment. They are also micro-cultured as food for various species of adult marine animals, as well as used and tested as a food source in the research of culturing and rearing all kinds of tank-raised fry. • Copepods and amphipods most often appear in closed aquarium systems after live sand and/or rock has been added. They will “bloom” in the tank when the temperature is slightly warmer and a food source is available. Another critter that may be seen is the isopod. Also called pill bugs, fish lice and rolly-pollies, these animals are found in all parts of the marine environment. Most isopods are free living and harmless, feeding on detritus and algaes, however, some are predatory, or parasitic, and dangerous to other reef aquarium animals. How did these “pods” get into the tank? Well, they’ve most likely been there for a while, just not in numbers large enough to notice. These organisms are microscopic or plankton sized when they start out, so until they grow large enough to be seen with the naked eye, you don’t know they are there. They hitchhike in on live rock and sand, and it is only after you have placed it into your aquarium that these organisms crawl out and make themselves at home. If you have a large population of “pods” naturally, count yourself among the lucky few. Many aquarists go to great lengths to create a large healthy population in either their tank or refugium. Remember, these “bugs” are a natural part of a healthy aquarium ecosystem, as well as an important food source required by some species to survive. In most cases they won’t hurt anything. You shouldn’t have to do anything about them. If you are concerned however, you can provide a natural predator which should keep the population under control. Here is a list of species which pick at live rock, or sift substrate in search of these tasty morsels. Keep in mind those fish marked with a * are species which feed on these bugs as their primary food source. They are challenging to keep, requiring a well established aquarium with a consistently high “pod” population to live on lest they starve. Keeping more than one of these obligate “pod” eaters in a tank will most likely lead to a depleted food source. • Most Firefishes are planktivores which may occasionally pick these bugs from the rock. • Most Angel, Butterfly, Hawk, and Wrasse species spend their days grazing on fauna found on the rocks, however, do not consider this as a primary food source – merely an opportunistic treat. • Seahorses feed primarily on these “pods” but are not a beginner fish and should not be housed with other fish. 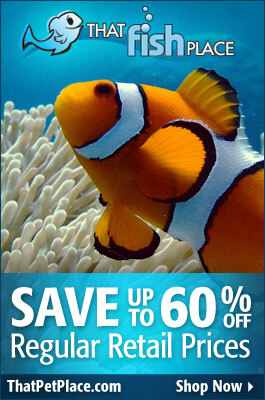 • Buy some good invertebrate identification books for your saltwater reference library. • Refer to marine invertebrate database and profile information, as well as photo galleries. • If you have a personal saltwater Web site, create something like a “Can You Help Identify This?” page. You can display photos here and allow visitors to email back to you about them. • Post a message in various aquarist forums asking for help with identification. If possible include a photo of good clarity, or provide a link to a Web page you may have created as described above. *Photo Emailing Tip: When you email a photo to another aquarist asking for help with identification on something, be kind. Only send an image that is reasonably sized, and is clear enough to tell what you want identified including a “brief” description.